As a benefit of membership, members receive a printed copy of the Michigan Society's newsletter. A meeting reservation form is enclosed with each newsletter. 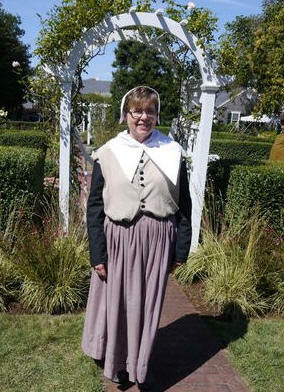 Bonnie Vokits in costume at Plymouth, where her ancestors landed in America. In a few days, we will be celebrating Thanksgiving again. For some it is just a time for family and friends to gather for a big dinner. Usually, at some point I recall my mother and grandmother reminding me that I am a descendent of Elder William Brewster. I also recall that picture I had seen in grade school of the Pilgrims and Indians sitting around a table outside on the lakeshore and a man praying for the plentiful harvest they were about to share. They say a picture is worth a thousand words, but this picture does not do justice to what they went through for almost 20 years prior to that first Thanksgiving. I never would have learned about that story if we had not taken a Mayflower Descendant tour of England and Holland where we journeyed through the hometowns and parishes of the Pilgrims and heard the story from the English and Dutch. It is a story that is not even written in our own textbooks. It is a story of a group of people whose life was a journey of sacrifice, commitment, courage and a deeper faith than I have ever known, in order to have the freedom to worship the God they had come to know. It is a story of how two men, William Brewster and William Bradford, who became the leaders of the Separatists Movement, had become friends while studying at Cambridge. They were exposed to the teachings of Luther and Calvin and were influenced by the Protestant Reformation, which had been going on in Europe. They began studying the Bible in secret, out of fear of being caught and executed for opposing the Queen, who was the Supreme head of the Church of England. They began to realize what she required to be taught and to believe was contrary to the Bible. As their relationship with God grew, so did their numbers. They also realized it was too dangerous to stay in England. Excerpt from the Muskegon Chronicle. 22 November 2011.